← Sittin’ On the Dock of the Bay…. My sweetie was making fun of me a few weeks ago, as we were preparing for our trip. You see, I was sewing, tricking out my VW Beetle as a matter of fact. If you’ve ever been in a VW New Beetle, you know there is A LOT of window/glass surface. It’s because of the cute little dome shape of the roof, makes the windows larger than the average vehicle. And there are no visors, or shades, to block the sun coming in the side windows. So…I made some. Cute little Joel Dewberry home dec weight fabric visors with a durable black rip-stop cloth on the side that faces out. So, my sweetie was teasing me three days prior to our car trip, but on day one of the trip, not one hour into the drive, he was praising my foresight and ingenuity. 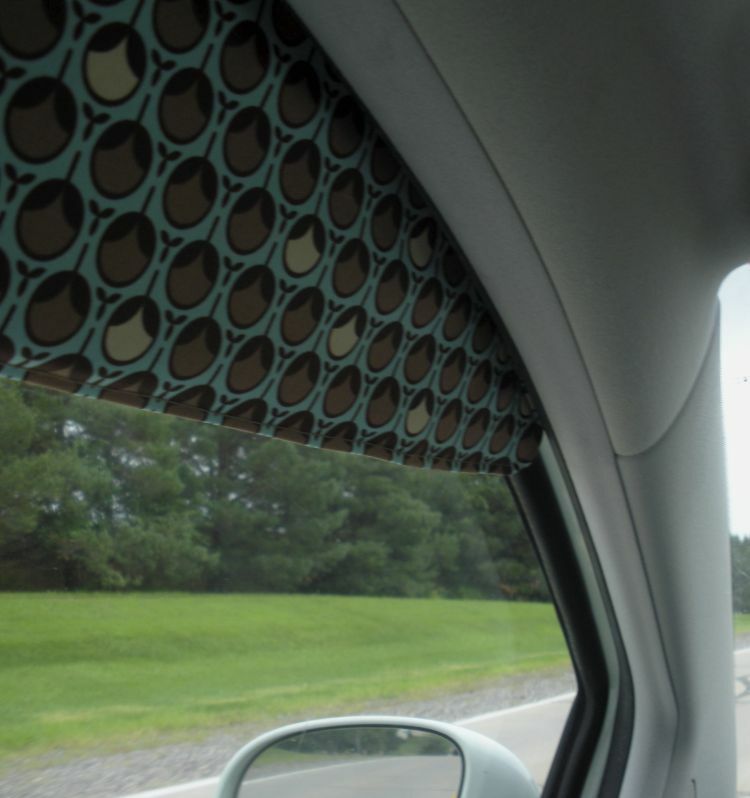 My car is a very light, soft aqua green color, so the Joel Dewberry fabric matches perfectly. 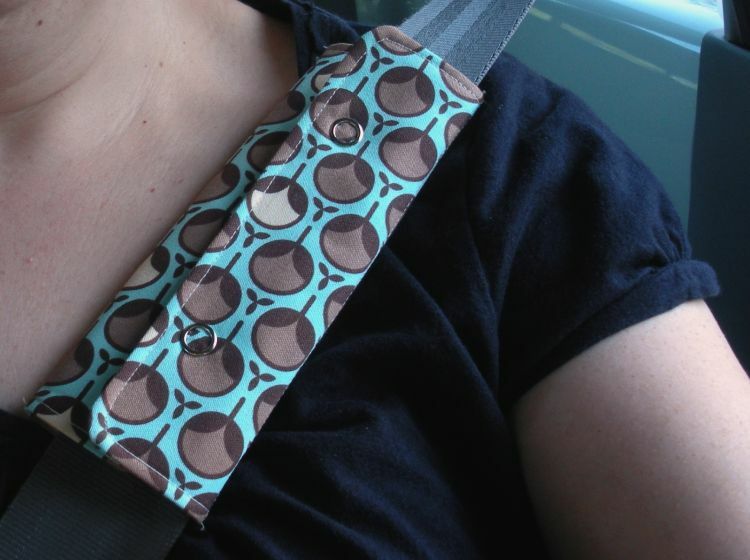 And, lest the seat belts felt left out, I decided to make seat belt covers to cushion the driver and passenger’s neck while strapped into the car. What a talented bug YOU are! Very, very neat. And being a New Beetle owner myself, you know I'll be pestering you for your “how tos.” What a nifty idea! I'm very impressed. Cute. My first car was a bug (a 1961 one) and I took the torn roof fabric out and replaced it with a leopard skin fabric. It was quite the hit. Mine was aqua colored too. I loved that little car. The ingenuity of quilters never ceases to amaze me. Cool car! and it's definitely now a one-of-a-kind. I'm so glad you received spousal praise for your planning and sewing. wow…..love your work! How neat are those accessories! Sure beats trapping a towel in the door to provide some shade!…love that your car is aqua – too cool! How inventive of you Doris with the color coordinated sun visors! I have made seat belt covers myself – my Dad had a pacemaker and the belt hit his wrong, so I made nice soft fleece ones for him. 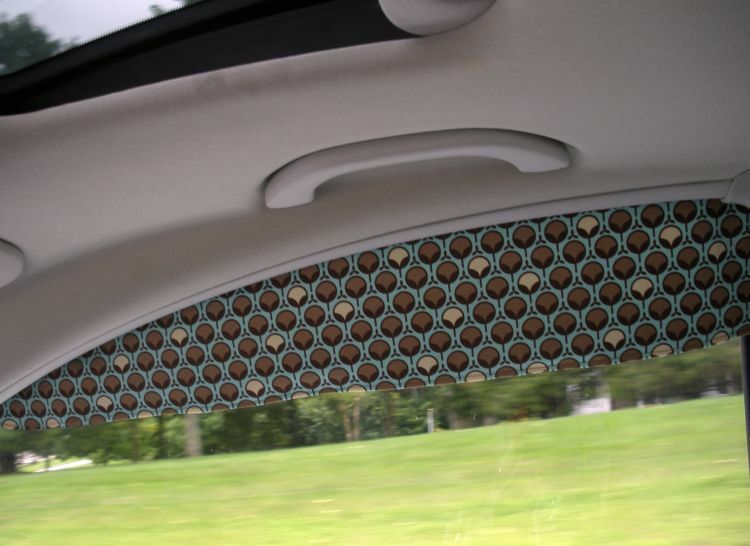 i LOVE your handmade accessories for your car! i thought about sewing up some for my van (which was new to me about 2 years ago). funny how that never got done. hmmm. You would think that VW would have better visors. Oh well as a new beetle owner myself I am loving your sun protection. I must make some for my little bug. Will you be doing a tutorial?